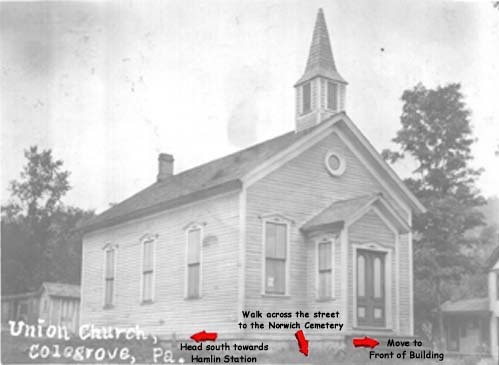 On April 20, 1874, members of the community of Colegrove, located in Norwich Township, and citizens of Keating Township decided to incorporate the Union Church of Colegrove. The corporation notice was published in the McKean Democrat newspaper for three weeks, and an incorporation notice was filed in the Court of Common Pleas of McKean County. It was approved on April 29, 1874. The church was built in 1880, much of the cost being donated by Mrs. N. W. Heinemann. Before that she had been the main support of the services and a Sunday School held in a poorly built church across the road from the present structure. The church at Colegrove, across the road from the cemetery, is the oldest one in the Township and was known as the Community Church but it was used mostly by Methodists. Land for the church was deeded to the five-member board of trustees on Feb. 10, 1886, by Jonathan and Hattie Colegrove, and recorded on Sept. 7, 1886. The transaction of land for the church was one dollar. Historical events of the church. In 1905, Mrs. Leola Norse was baptized in the church by the Rev. J.A. Perkins. During World War II, the Rev. W.H. Edmunds was the minister of the small one room church. On Sunday, Jan. 26, 1919, a memorial service was conducted for the following soldiers killed in action; Pvt. Ernest G. Richardson, Betula; Cpt. Oscar W. Hodetedt, Colegrove; Sgt. Willian R. Cleveland, Crosby; Johnny R. Gifford, Crosby; and Ralph L. Burdick and Claire B. Gallup, both of Colegrove. The Rev. Gordis Tubbs had scripture and prayer during the memorial service. On May 31, 1947, the first marriage ceremony was performed in the church. Victoria M. Peterson and Scott D. Thomas were married by the Rev. John Bailey. Early in 1938, repairs were made to the interior of the church through a donation made by Ralph Burdick of the Hamlin Bank and Trust Co. Mr. Burdick offered to pay the balance of the costs if the church's ladies aid society would collect $100. Since this first money-raising effort for repair work, members of the church and interested citizens have continued with the fundraising. In 1978, the Knights of Columbus of St. Elizabeth's Catholic Church in Smethport established the restoring of the Union Church of Colegrove as their special community project. The last will and testament of C.A. Anderson, one of the original trustees of the church, stated, "the church will be bequeathed to the community in perpetuity as a community church for all denominations and be known as the Union Church of Colegrove Inc."
As the little brown church in the vale." This is the first stanza of the hymn "The Church in the Wildwood," which has become the theme song for the Union Church of Colegrove, where more than 60 people joined last Sunday to celebrate the church's 100th anniversary. The Rev. Kenneth Tulloch, pastor of the Methodist Church in Port Allegheny, delivered the sermon. "Let us pray this church in the wilderness remains as a symbol of God's enduring, loving, forgiving presence in this world," he said. 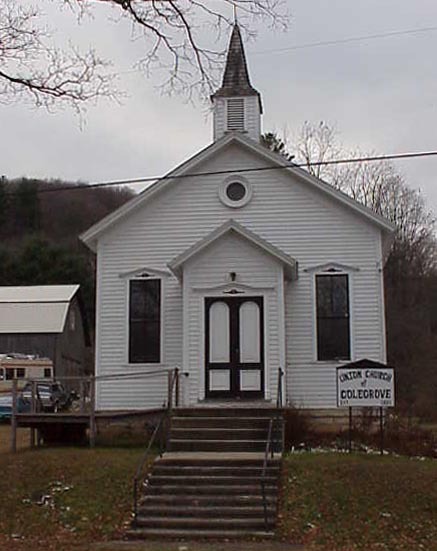 On April 20, 1874, members of the community of Colegrove, located in Norwich Township, and citizens of Keating Township decided to incorporate the Union Church of Colegrove. The corporation notice was published in the McKean Democrat newspaper for three weeks, and an incorporation notice was filed in the Court of Common Pleas of McKean County. It was approved on April 29, 1874. Land for the church was deeded to the five-member board of trustees on February 10, 1886, by Jonathan and Hattie Colegrove, and recorded on September 7, 1886. The transaction of land for the church was one dollar. During the special anniversary service, Mrs. Marie Benson of Crosby highlighted historical events of the church. In 1905, Mrs. Leola Norse was baptized in the church by the Rev. J. A. Perkins. During World War II, the Rev. W. H. Edmunds was the minister of the small one-room church. On Sunday, January 26, 1919, a memorial service was conducted for the following soldiers killed in action; Pvt. Ernest G. Richardson, Betula; Cpt. Oscar W. Hodetedt, Colegrove; Sgt. William R. Cleveland, Crosby; Johnny R. Gifford, Crosby; and Ralph L. Burdick and Claire B. Gallup, both of Colegrove. The Rev. Gordis Tubbs, who died this year, had scripture and prayer during the memorial service. The last will and testament of C. A. Anderson, one of the original trustees of the church, stated, "the church will be bequeathed to the community in perpetuity as a community church for all denominations and be known as the Union Church of Colegrove Inc."